As always, there's a public Google Docs data sheet. For the sharp eyes, you can often see me working in there, I can see how many live viewers I have, we can even comment in Live Chat (on the right, all Google Docs do that). What I want to do here is tell a lot, with not a lot - you do not need me to which bars are big and which are small. 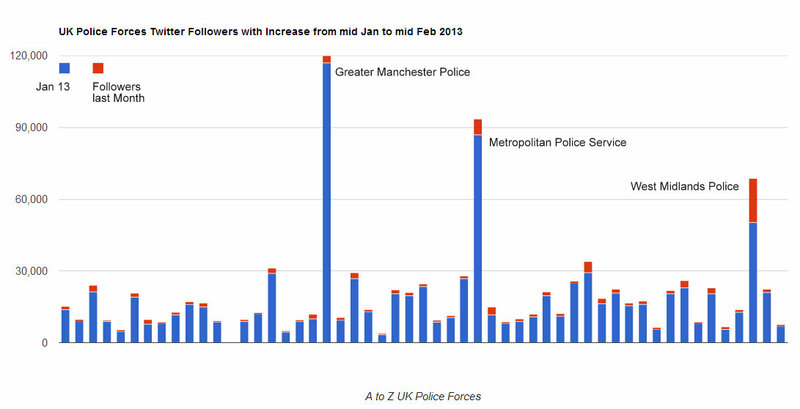 From the Twitter chart we have, the three big guns: Manchester, Metropolitan and West Midlands. Next month will be a real fascinating read, cannot wait for that. 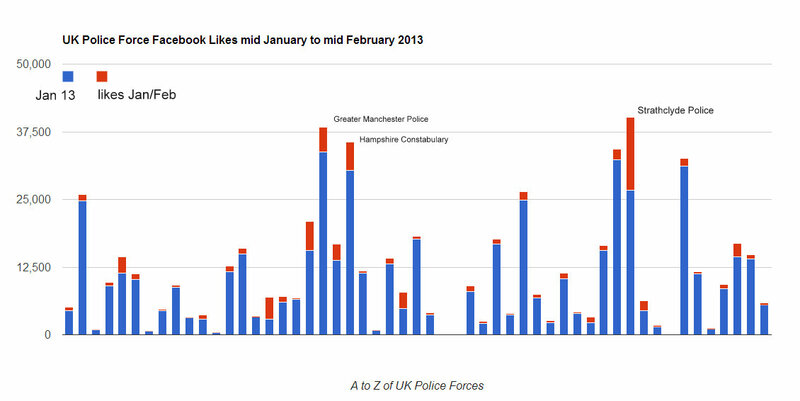 Moving onto Facebook likes, Strathclyde have come from nowhere, into the top spot. No idea how that happened. Know something, get in touch. It seems those already have a presence are increasing steadily. For me, the most fascinating part is YouTube. 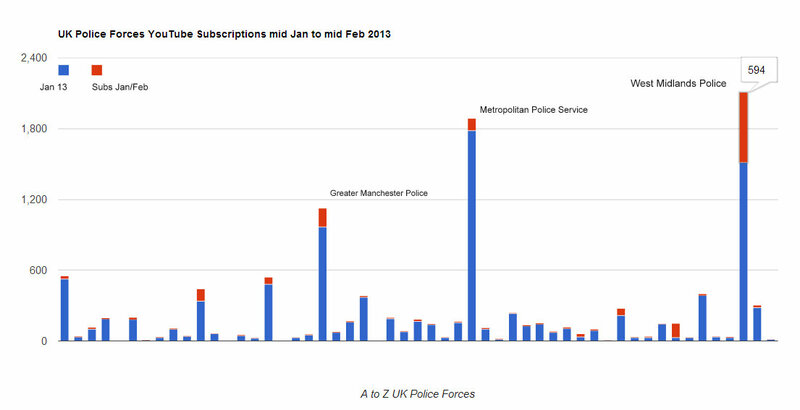 West midlands Police have picked up 594 Subscriptions bringing them top of the heap. 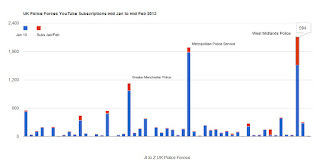 It makes the others, even Manchester and the Met dwarfed. Once again, I will be on the phone to the Press Office next week to ask why. We can all learn from this. 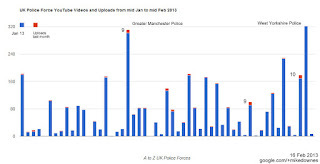 There were 83 videos uploads by all forces in a month with 28 of them by three forces. 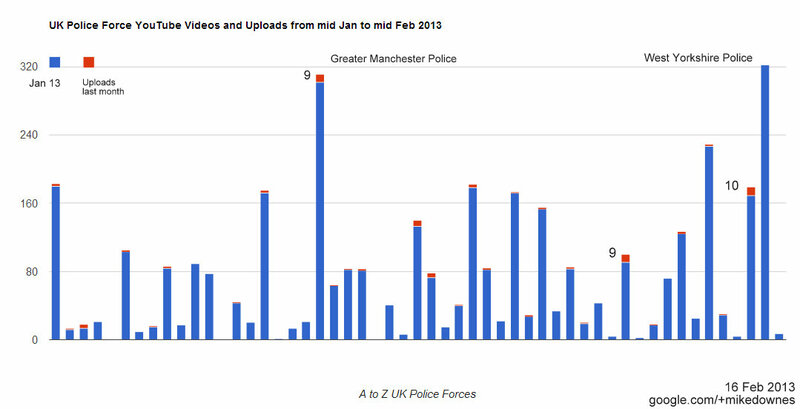 In my view, YouTube should be the biggest grower as 2013 is the year of the video. The trick will be to make them short, timely and produced with ease. Video Production should not be something that takes weeks. We have the technology, often just a smart phone, to make great clips. Let's all try better at this one. As you know Hangouts are my specialty. I'm mixing that with Pre and Post Production skills these days. 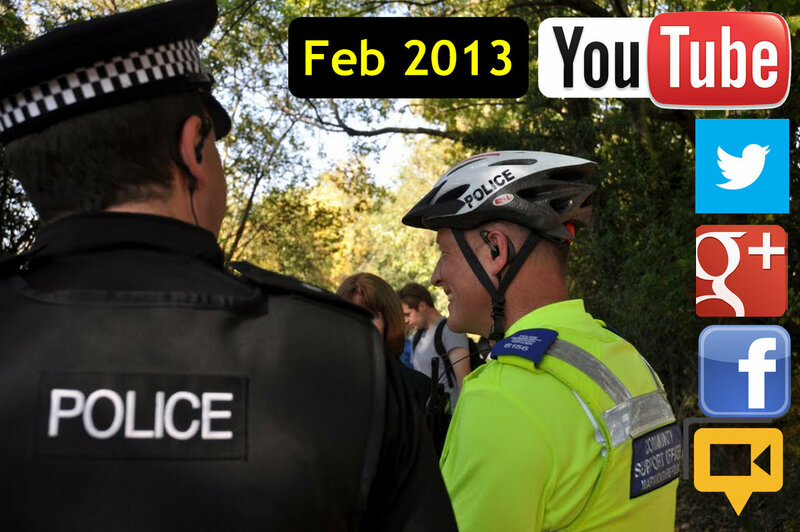 Watch my YouTube Channel for the updates. There were no real numbers to report on Google+ or Hangouts On Air. 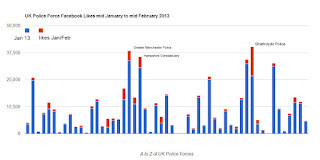 I know there are Events coming up for Hangouts in UK Policing with a few more forces getting involved. 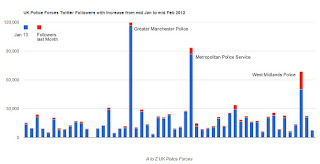 It was brilliant for me to see ACPO getting involved and the friendly response I received from the Press Office. For me, it's in the Education. My involvement in this, just a curious bystander with wifi and a laptop. That lets me ask the questions, and sometimes get the answers that others do not. By the way, every time before I post I look on the web to find this stuff out. That's why I'm doing this survey as I could not believe it when I could not find one (know of one, let me know). I'm off to look closer and think about the philosophy about those charts. 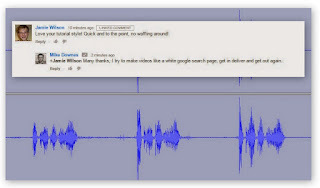 One simple deduction, Tweet stuff that is on your own video channel. make sure it's new and directly relevant to the people you serve. Better still, make sure it's Tweeting yourself LIVE in a webcam in RealTime. One day, your fingers will get fed up with typing, and talking will take over. That time is very close at hand ..